You know how the writing mavens warn you against letting yourself get carried away by your research? Against noodling around in depth upon depth of interesting stuff instead of turning out text? Today we consider how much fun you can have if you ignore them. At present, I’m plotting a mystery that will involve a rare books library and its collection of illuminated manuscripts. My first and most valuable co-conspirator is that deeply respectable institution, the British Library. Their daily Medieval Manuscripts blog greets my every morning with some new twist on their very old theme. The BL is digitizing its collection, so you can burrow down to find what interests you or browse just for fun. For facts and figures, and above all to avoid howlers, I’m studying Christopher de Hamel’s 2017 blockbuster, Meetings with Remarkable Manuscripts. (Okay, it may not have been on the bestseller lists. But it’s 632 pages long and weighs three pounds.) De Hamel is the former librarian of the Parker Library of Corpus Christi College at Cambridge, a treasure house of manuscripts. De Hamel travelled the world to research this book, visiting twelve of the most important and most beautiful manuscripts in existence. The earliest dates to the late 500s, the latest to about 1515. Each essay combines his travels, accounts of each rare book library and its denizens, his musings on the manuscripts – including some new observations and deductions on the making and history of each – with multiple images of the illuminations, of their present homes and of the men and women who bought, sold and preserved them. Chapter One concerns the Gospels of St. Augustine, owned by Corpus Christi itself. It is the oldest surviving Latin gospel book anywhere in the world. The saint in question is not the fourth-century Bishop of Hippo but the missionary who brought Roman Catholicism to England. 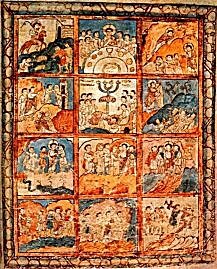 The book’s readings of the text and its imagery served as exemplars for later and more elaborate gospel books down the centuries. 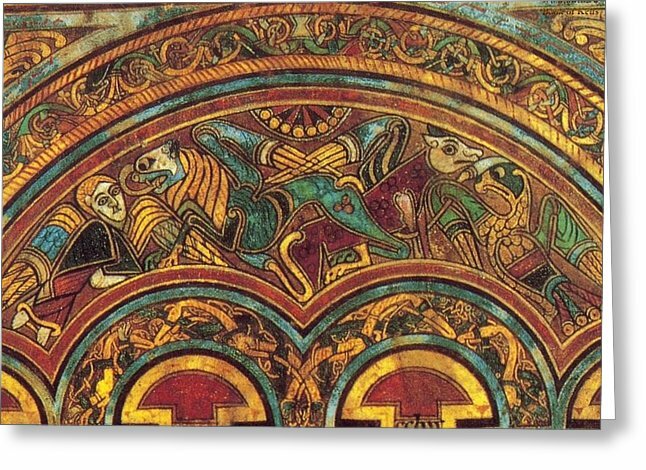 Its predecessors may be even more interesting: scholars suggest links between the style of its art and Ethiopia, a home of early Christian monasticism. 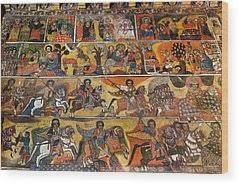 That style of Ethiopian religious painting persists today. De Hamel’s anecdotes are even more enticing than his scholarship. Here we see him in his librarian persona, dressed in full academic regalia, presenting the Gospels of St. Augustine for Pope Benedict’s veneration when he visited England. That’s Rowan Williams, the late Archbishop of Canterbury, on the left. The Gospels of St. Augustine are also used during the enthronements of Archbishops of Canterbury, and at the last two such ceremonies, de Hamel again presented the book. 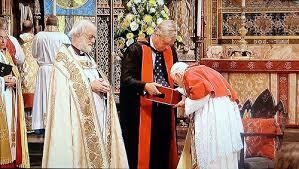 He reports that in 2003, at the enthronement of Rowan Williams, at the first vibrating notes of the opening hymn, the parchment pages of the book rose and fluttered. He adds that the same did not occur for the current incumbent. The Copenhagen Psalter, we learn, was probably created as a first reading book for a young prince. This purpose is demonstrated by a large, carefully drawn alphabet and a table of punctuation and abbreviations. Its illuminations are certainly royal. 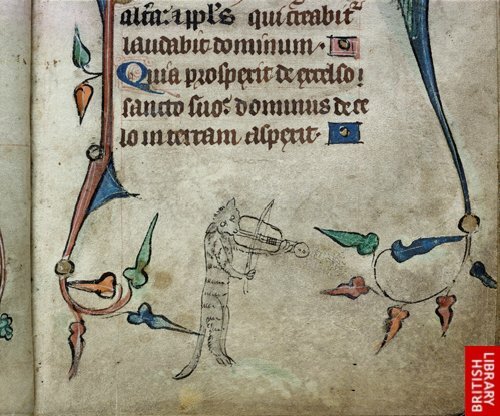 If manuscripts, de Hamel says, were accompanied by music, the Copenhagen Psalter would require trumpets and a church organ. The St. Petersburg National Library is the current home of the Semideus. When de Hamel arrived, he went through a near-Soviet experience of rigid and inexplicable bureaucracy interspersed with casual Russian friendliness. At last he settled down to inspect the precious manuscript. He was so immersed in his work that it was well past lunch time when he looked up. The Russian invigilator keeping watch over the reading room realized he had missed the meal – so she brought him a handful of whiskey-flavored chocolates to eat while he continued to handle the manuscript. Could I put together my mystery plot with less information than this? Logic says yes. I say no. These winding little back alleys of fact are putting flesh on the bones of my story and slowly filling the memories (and the unconscious) of several of my characters. At any rate, the mavens can’t prove that I don’t need to do this. Until they can, I plan to enjoy myself. 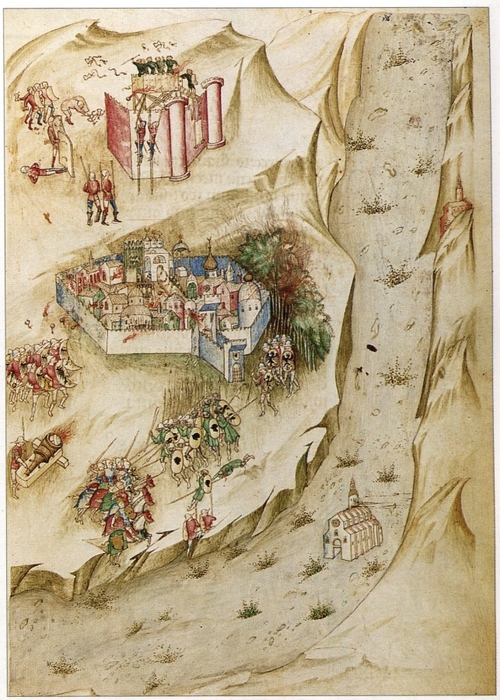 Posted on April 2, 2018, in books, Heidi Wilson, research, Uncategorized, Writing classes and tagged Archbishop of Canterbury, Christopher de Hamel, Corpus Christi College, Hugo Pictor, illuminated manuscripts, Meetings with Remarkable Manuscripts, Research, St. Petersburg National Library, The Book of Kells, The Carmina Burana, The Codex Amiatinus, The Copenhagen Psalter, The Gospels of Saint Augustine, The Hengwrt Chaucer, The Hours of Jeanne of Navarre, The Leiden Aratea, The Morgan Beatus, The Spinola Hours, The Visconti Semideus. Bookmark the permalink. Leave a comment.